U.S. President Barack Obama gestures during his remarks to reporters after a bilateral meeting with Canada's Prime Minister Justin Trudeau alongside the Asia-Pacific Economic Cooperation (APEC) Summit in Manila, Philippines, Nov. 19, 2015. The U.S. House of Representatives is planning to vote Thursday on a bill sponsored by the Republican majority that would pause the Obama administration's program to resettle Iraqi and Syrian refugees to the United States. 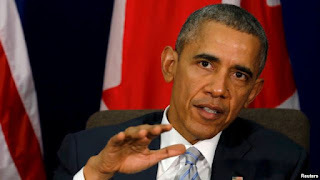 President Barack Obama is threatening to veto any such measure, and signaled on Thursday he anticipates the resettlement plan will go forward. 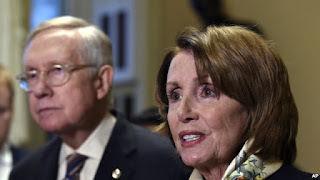 FILE - House Democratic Leader Nancy Pelosi of Calif., right, speaks as Senate Minority Leader Harry Reid of Nev., left, listens. The bill already faces Democratic opposition. House Democratic leader Nancy Pelosi and other House Democrats have come out strongly against any measures to block Syrian and Iraqi refugees, saying they already are rigorously vetted under the present system. The ranking Democratic member on the House Foreign Affairs Committee, Eliot Engel, told VOA the United States should not slam the door on those who are facing the same terror from Islamic State militants as the Paris victims. Three Democratic members, Representatives Adam Schiff, Bennie Thompson and Zoe Lofgren, put out a statement opposing the bill, saying: "The House Republican legislation would immediately shut down all refugee resettlement from Syria and Iraq — possibly for many years — and severely handicap future refugee resettlement around the world." But Republican Homeland Security Committee Chairman Michael McCaul said Islamic State militants have declared they want to exploit the refugee admission process to carry out terrorist attacks in the West. McCaul told reporters that Federal Bureau of Investigation Director James Comey warned it is difficult to vet refugees from Syria because of the disastrous situation there. He explained that the bill would require the FBI director and the heads of the Department of Homeland Security and the Director of National Intelligence to certify that each would-be refugee is not a national security threat. McCaul said the FBI will come up with a way to perform background checks on the refugees. He said the Obama administration would then have to take full responsibility for making sure the migrants do not pose a security threat. Some conservative Republican members of the House Freedom Caucus voiced concern that the bill does not go far enough, because it does not completely block all refugees from entering the country. Obama has promised to take in 10,000 Syrian refugees during the coming fiscal year. While remaining the world's No. 1 haven for refugees, the United States has only taken in about 2,000 Syrian refugees during the past four years of civil war in that country. If the House passes the bill, it is not clear if the Senate will take it up.